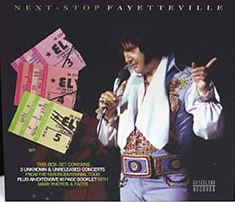 Elvis 'Next: Stop Fayetteville' from 'Graceland Records' features three concerts from Fayetteville, NC, Cumberland County Memorial, August 3rd, 4th and 5th, 1976 shows and is presented in 3CD-digipack, in slipcase, with great 44-page booklet filled with many rare photos (some are presented for the very first time) of Elvis on stage in Fayetteville. You can't go wrong with this set. If you know the 'Graceland Records' releases, you'll will love this ! 'Graceland Records' label managed once again a rare momentum. This time it's not just one show, but 3 complete and previously unreleased concerts. They were not available in any form - until now! Rumours lingered about only a few songs he sang on the 3th of August 1976, but nobody heard it since that day. NOTHING was known about these 3 concerts, no recorded evidence, no track listings available, too. Just rumours. These 3 concerts are definitively rare and also very good, for the hot summer of 1976! On August 3rd, Elvis is in good mood and the audience really joins in. Elvis loves it and interacts tremendously! Wow! Best moments of this show: America The Beautiful (with reprised last part), Love Letters, Hawaiian Wedding Song and very rare (unusual for summer of 1976) performance of An American Trilogy! On 4th, Elvis was looking forward to perform again and he gave a hell of show, playing off the roof. Great moments: And I Love You So, America The Beautiful (with reprised last part) and two full performances of Hurt. The August 5th was closing show of whole tour and last ever Elvis show in Fayetteville. Elvis makes sure the people from Fayetteville will remember that he was there, giving another fantastic performance. Best songs: America The Beautiful (with reprised ending), Jailhouse Rock, Love Letters and Hurt (with reprised last part). Speaking about somewhat up & down shows of summer '76, this is certainly Elvis at his best. Those 3 shows are definitely 'up' and far from being 'down'. These rare audience recordings came from a non-fan, who recorded it since he believed it was historical moment. At 'Graceland Records' we are very grateful since these are almost beyond par the best concerts of the 1976 Bicentennial tour, I very good sound !